A Consultation with Dr. Samuel Ciricillo Jr.
My sister has just been diagnosed with Trigeminal Neuralgia. Can you please tell me more about it? Trigeminal neuralgia (TN) is a condition that can cause chronic, recurrent, severe pain in the facial region — and though each episode may be brief, the pain it brings may become quite intense. TN is also known as tic douloureux (derived from the French word for “painful”), and is accompanied by involuntary, rapid and repetitive spasmodic pain. The source of this pain is the trigeminal nerve, which is actually a pair of nerves that exit the brainstem through the skull, one on each side of the face. 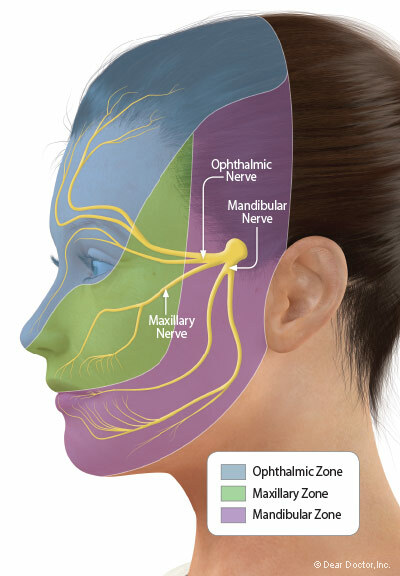 Each nerve has three branches, serving the upper, middle and lower parts of the face and jaw; one or more of the nerve branches may be affected by this disorder. Pain — ranging from mild to excruciating — is the major symptom of trigeminal neuralgia. It may start as a twinge that is felt occasionally, and progress to episodes that last for several seconds and recur over a period of weeks, months, or years. Chewing or speaking can trigger the pain, or it may be set off by a light touch — like shaving, putting on makeup, or even wind blowing on the face. About 150,000 people are diagnosed with trigeminal neuralgia every year. This condition is most often seen in people over age 50, and is more prevalent among women than men. TN is sometimes associated with multiple sclerosis and similar inflammatory disorders, which damage the protective insulating sheath around nerve cells. Less commonly, it may result from tumors or other brain lesions, or follow herpes infections (cold sores). While the exact cause of trigeminal neuralgia isn’t always known, it often seems to result from an artery or vein pressing on the nerve. This compression injures the fatty covering (myelin sheath) that insulates the nerve, causing it to become hypersensitive and to function erratically. The affected nerve may transmit pain signals at the slightest stimulation, and fail to “shut off” after the stimulation has ended. If you are experiencing facial pain, it’s very important to get an accurate diagnosis; that’s because several other conditions — temporomandibular disorders and dental abscesses, for example — may have symptoms similar to TN. A neurological examination, including touching and examining different areas on the face, will help pinpoint the problem. Your doctor may also order an MRI scan of your head, to look for a tumor or a blood vessel contacting the nerve. It’s not uncommon for several specialists, including dentists and neurologists, to become involved in the diagnosis and treatment of trigeminal neuralgia. Fortunately, a number of treatments are available for trigeminal neuralgia. While the condition may not be curable, it can generally be managed effectively with medications, injections, or surgery. Treatment generally begins with the most conservative measures, typically using medications that block pain signals from reaching the brain. Anticonvulsant drugs, which stabilize the nerve and thus decrease the abnormal firing, are a first-line treatment that often brings relief. If medications aren’t enough to control symptoms of TN, or if side effects become too bothersome, there are several surgical procedures that may be recommended. One approach, known as percutaneous (“per” – through; “cutaneous” – skin) treatment, involves passing a thin needle into the nerve itself. Some nerve fibers are then selectively damaged so they no longer transmit signals of pain. These procedures are often recommended for older patients, or those in poor health. Another approach uses standard microsurgical techniques to expose the trigeminal nerve and move aside the artery or vein that may be compressing it. While it is often effective, this technique has a small risk of complications such as facial numbness or decreased hearing. Alternatively, stereotactic radiosurgery — using a precisely controlled beam of high-dose radiation as a surgical tool — may be recommended in some situations: for example, in elderly patients, or in those wishing to avoid an open operation. In each case, health care professionals will carefully consider all of the alternatives before recommending a particular type of treatment for trigeminal neuralgia. While this condition has the potential to cause serious and disabling pain, the good news is that, in most cases, it can be effectively managed. Authored By: Dr. Samuel Ciricillo Jr.